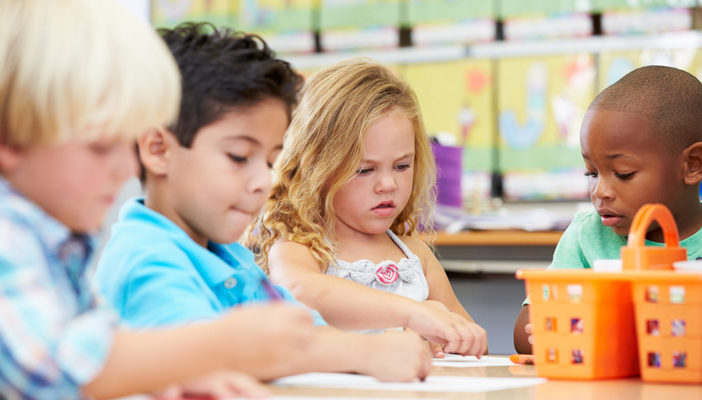 J Brown, a teacher of children with vision impairment and blogger for Paths to Literacy, shares six tips for parents preparing their child with vision impairment for preschool. It won't be long now before a new school year begins. This brings excitement for parents, as well as children, but it can also bring worry about the transition, especially for young children who have vision impairment. The tips here can help you and your child get the year off to a great start! Two weeks before school starts, begin an evening and morning routine. Set a bedtime and wake up time. The bedtime routine might include a bath, story, song and tuck in. In the morning, give your child enough time to the morning to wake up, get dressed and eat without needing to rush out the door. Create a visual or tactile schedule for your child for the evening and the morning. An example of a visual schedule might be pictures of your routine. For the evening routine, include a picture of a bath tub, toilet or diaper, pyjamas, a book and bed. A morning schedule may have a picture of a bathroom or diaper, an outfit, a bowl of cereal, backpack and picture of the teacher or school. To create a tactile schedule, glue objects onto cards. For example, the evening routine may have a washcloth, diaper, piece of fabric for clothing, book and blanket fabric. The morning routine may have a diaper, spoon or label from a box of cereal, fabric for clothing, backpack strap and an identifier (something the child uses to recognise them) for the teacher or school. Minimise or expand the schedule as appropriate for your child. Some fun stories are ‘The Kissing Hand’ and ‘Mouse Loves School’. Attend open days and visit the teacher before school starts. If the teacher allows, take a picture of your child with their new teacher. If your child uses an identifier to recognise their teacher, ask what the identifier is, then include the identifier in the schedule. Ask the teacher about communication. Can you contact the teacher during the day? Will they write a daily note? Do they use a communication notebook? If your child is riding the bus, try to get ready by the time they should be on the bus. If you are taking them to school, drive there during the time you would need to each morning. Map out alternate routes in case of traffic or accidents. The night before, do as much as possible to prepare so that in the morning you can focus on your child. Plan breakfast and set it out. Pack your child’s backpack with a spare change of clothing, diapers and food. Pack any necessary medical supplies. Get up early to get yourself ready before your child. Allow yourself to be excited, happy, sad and nervous or a combination of these emotions. This is a big transition for your family. It can be scary entrusting your child to new people. Preschool is a fun and exciting time for your child and your family. Give yourselves time to adjust to the new routine and experiences. Embrace this opportunity and enjoy it!